Sophomore Mariah Blackburn stands next to art pieces at the 12th Annual High School Art Competition and Exhibition, hosted by Columbia College. Blackburn was one of a group of RBHS students who earned prizes for their pieces, taking home first in Paintings. 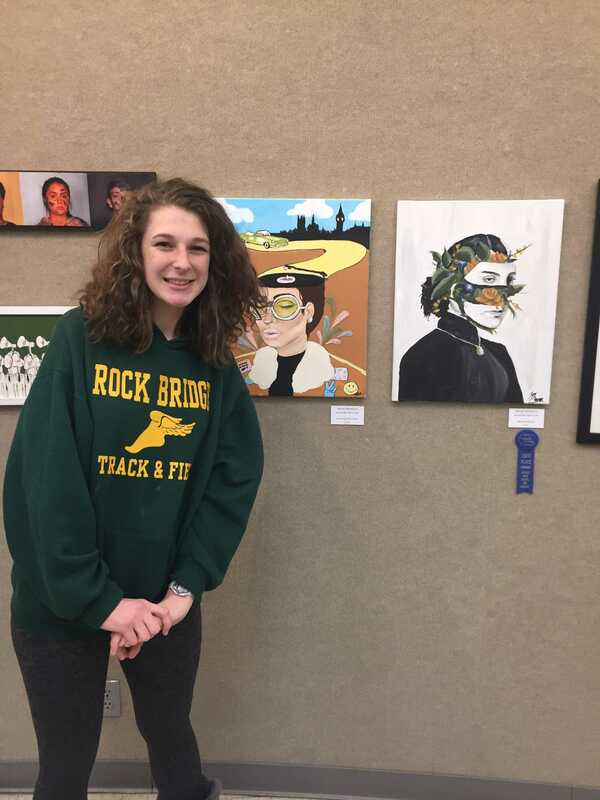 The 12th Annual High School Art Competition and Exhibition, hosted by Columbia College, ended Jan. 21, marking the finish of what was a rather successful art contest for RBHS students. The competition was open to any rising artist in the mid-Missouri region who desired to exhibit their artwork. Artists were open to enter their pieces in any of the provided categories, such as paintings and photography. At the end of the competition, several RBHS students emerged victorious in several categories. Senior Ian Koopman, for example, won second in Paintings, while sophomore Mariah Blackburn emerged victorious, taking home first in the same category. Blackburn initially participated because of the possible academic opportunities the exhibit could provide if she happened to win in a category. After witnessing the number of pieces at the exhibit, however, she was unsure whether she would place in her respective category. This, however, ultimately didn’t matter in the end. Junior Izzy Gompper also competed in the exhibit after her art teacher recommended her to do so. While she didn’t place in her respective category, she believes it was a phenomenal exhibit which she hopes to be a part of in the future. Blackburn, like Gompper, feels that her experience in the exhibit was a very delightful one, and is motivated to continue participating in future exhibits as well. Did you participate in the exhibit? Did you attend? If so, let us know about your experience in the comments below!